Salt from water softeners are a major source of chloride found in Minnesota's waters. The use of water softeners in Minnesota homes is causing more salt to enter the state&apos;s waterways. That&apos;s the finding of a University of Minnesota study, which looked at where the chloride found in the state&apos;s lakes, rivers and streams is coming from. Road salt, used heavily in the winter, is easily the largest cause of changing chloride levels in Minnesota waters, with synthetic fertilizers and livestock excretion the second and third largest sources. 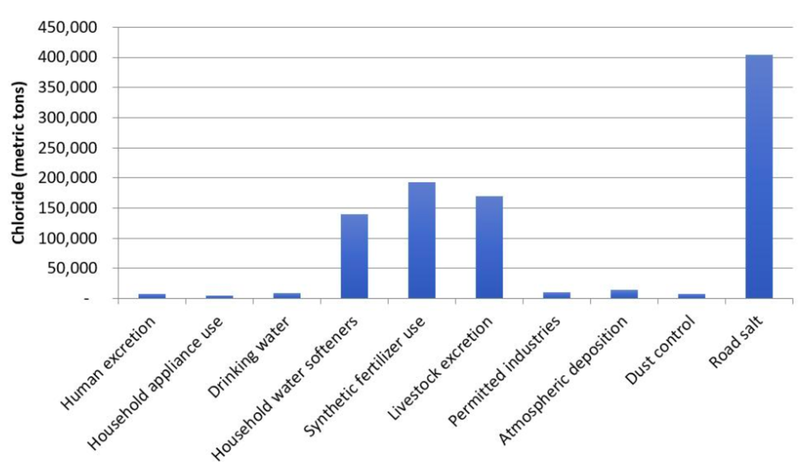 But not far behind, and attracting far less attention than road salt in the conversation about water pollution, is the use of water softeners in Minnesota households to lessen the impact of their "hard water" supplies. 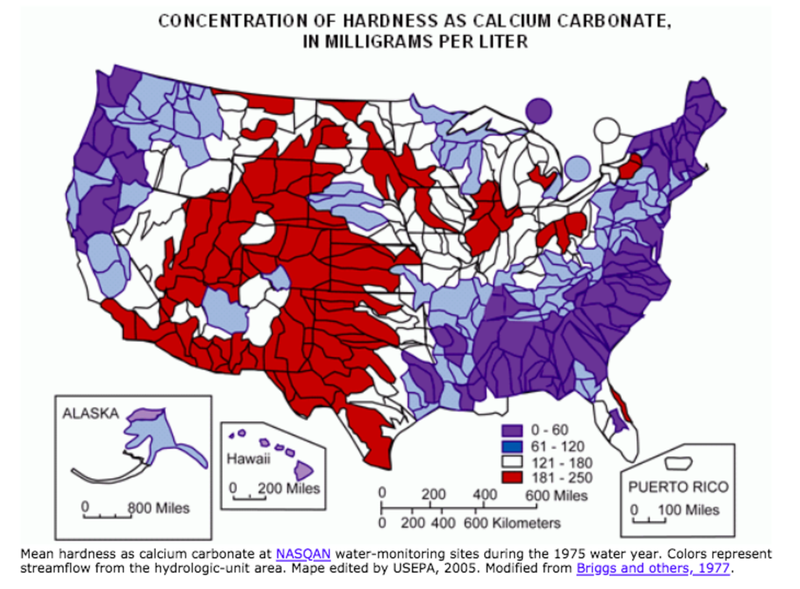 The U.S. Geological Survey identifies Minnesota as a state that has "moderately hard water," which is water with a higher content of minerals such as calcium and magnesium carbonate. Hard water can leave mineral deposits on glassware and cooking utensils, cause a buildup of scale on pipes and fixtures, and result in "dingy" clothes coming out of the washer, the Minnesota Pollution Control Agency notes. Water softeners can turn this into "soft water," thus extending the life and improving the efficiency of water heaters, dishwashers and other appliances, but it uses salt to do so, which ends up finding its way into Minnesota&apos;s natural waters. Areas with the hardest water are in red, followed by white, blue and purple. Water softeners send around 140,000 metric tons of chloride into Minnesota&apos;s water systems every year, the U of M found. And even though this is less than the amount coming from fertilizer and livestock, the impact could be greater because fertilizer and manure "are applied over a large area statewide," and as such "may have a lower impact on water quality than other sources." Elevated salt levels has led to fears being raised that by 2050, lakes in the Twin Cities will be too salty to support fish and aquatic plants, the Star Tribune reports. Softened water tends to drain to municipal wastewater facilities, but these are not designed to remove that much salt from water before it enters the environment. Sara Heger, who helped author the study from the U of M&apos;s Water Resources Center, told MPR that the results might surprise a lot of people because so much of the water on chloride in water centers on Minnesota&apos;s use of road salt. "A lot of people don&apos;t think about that their softener in their home is like that road salt — or that we&apos;re another source," she said. Salt in Minnesota waters has been a growing problem, with the MPCA saying levels are particularly high in the southern and western regions. The MPCA has tips for residents about water softeners – the first being to ask yourself whether you really need one by getting your water tested. It also suggests only softening water that needs it, for example not softening water used in outside spigots or cold drinking water taps. Upgrading to higher-efficiency softeners can also cut down salt use, and the MPCA just in general recommends reducing your overall water use. A report highlights just how much lead there is in Minnesota's water systems. 3M says the contamination could have come from other sources. Health officials found higher-than-healthy PFC levels in water supplies. 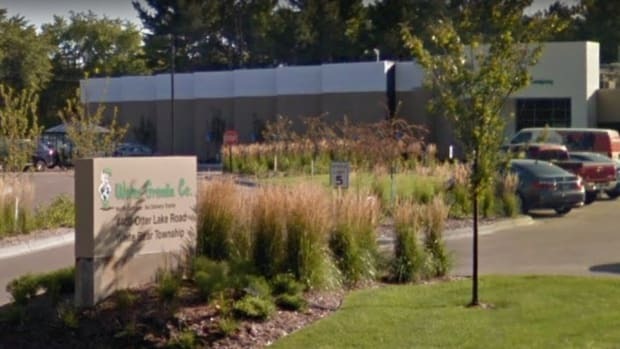 Water Gremlin stopped production after concerns over emissions of trichloroethylene.